According to the Abhidharma, the mind system can be conceptually divided in two: principal mind and mental events. The principal mind can be further divided into the eight consciousnesses, and there are fifty one different mental events. This evening, we would like to talk about the importance of devotion, confidence, and certainty. Devotion, confidence, and certainty are all qualities of the mind, not external phenomena. They do not exist outside of the natural energies of the mind. Another way of considering this is to see that there are three basic possibilities: the positive mind, the negative mind, and the neutral mind. Devotion is a very powerful, positive force. In relation to spiritual life, devotion is an indispensable tool for growth and realization. Devotion is also divided into three types. The first is called interest. This is when we are initially drawn to something that feels nice and seems to be good. The second is called longing, and the third, and most powerful type of devotion, is known as confidence. Of course, interest, longing, and confidence are all qualities of mind, but they usually manifest in sequence; first you develop interest, then longing or desire based on that interest, and ultimately confidence results by directly seeing the beneficial effects of devotion in your life. Interest, longing, and confidence are often not united; they are commonly spread out into various realms of application so that they arise separately and at different times. We need to bring them together in the fire of devotion; in union they are very powerful. If we don’t fuse them in practice, our understanding and spiritual realization will be weak. In order to have real confidence, the other two qualities of interest and sincere desire, must have already come together through a shared objective. If interest and longing are still separate activities, they do not have the power of transformation. If you have a little interest in the teachings, but not much desire to apply the practices that would help change your life and purify negative emotions, devotion is obviously weak. Without all three elements in unison, you can work quite hard and realize very little. To grow spiritually, it is very important to keep these three merged into a single devotional intensity. Upon seeing the teacher and the qualities evidenced by spiritual practice, and by hearing the Dharma, you naturally become aware of how nice it feels. There is a calm, soothing vibration that is very special. Effortlessly, you feel attracted and drawn closer. This state is known as interest. You are moved in a direction that nobody forced or pushed you into. Simply contacting the presence of the Three Jewels through seeing their qualities and hearing the teachings brings a very peaceful feeling and an intimation of something beautiful. You might feel like you’re coming home. The initial interest becomes intensified into strong motivation in this second step. In Tibetan gö-pa means “longing.” This is when you think, “I really should do this.” You feel you must finish the journey home, walk through the door, and step inside. You have a joyful feeling about getting inside. This leads to a strong practice and a meaningful response to the teaching. Having opened yourself, you become intimate with the Dharma, continually deepening and maturing in your understanding. This comes from practical acquaintance with the Dharma, like the familiarity experienced when you arrive home. You feel very relaxed and have certainty regarding what is true. When you were initially interested, you simply thought, “How nice.” Then through inspiration, you became determined to move in that direction. The level of confidence is when you’ve really come home for good. You no longer have any doubt or hesitation. You’ve settled into your own space and reached the point of relaxed confidence. No longer do you have to search and wander, driven by feelings of poverty or insufficiency. You are at peace. You feel full and comfortable, finally able to enjoy the wealth and riches within your own home. Confidence is very important. Without it you’re not going to attain enlightenment or be able to help other beings. Confidence encourages you to settle down, to relax into the fullness of what you already have so that you can see what is still to be realized or accomplished. You are able to feel at ease while learning to work with the whole situation, to creatively participate in the world and be of benefit to others. This effort is sustained by meditation. Realization comes through meditation, not just by studying and analyzing. Too much thinking and intellectual analysis only leads to more conceptions, following one upon another to the point where you’re merely hovering over the actual experiences of life, carried away by endless conceptualization. By over-indulging in intellectual analysis and conceptualization, we will be constantly plagued by doubt and hesitation. In clinging to concepts, we merely skim across the surface of knowledge and lifeexperiences, obscuring the original qualities of meaningful, participatory awareness. This prevents us from being of benefit to either ourselves or other beings. To have confidence in the Dharma and faith in the wisdom of love and compassion is wisdom itself. It is the means to full realize our buddha-nature and develop the capacity to benefit other beings. Such confidence is not stupid or ignorant, but is the fruit of clarity. Basically, confidence comes about in two different ways: practice and meditation. By practice I’m referring to mantra recitation, visualization, and the cultivation of love and compassion. Meditation is the process of completely settling ourselves and relaxing into our true nature; the state of total openness. Continuous practice and meditation will engender more and more confidence and equanimity. By settling ourselves in this understanding, by coming home in this way, we begin to feel joyful and enriched, calm and at ease. Any notions of loss, insufficiency, or lack of fullness completely dissolve. With great happiness, we can work for the benefit of all beings. Buddha said that the awakening of faith or devotion is the dawn of realization, like a great light rising and shining within the heart. Without devotion, you’re never going to feel any intimacy between yourself and the teaching or the lineage masters. You will feel separate. Devotion inspires us, bringing clarity, joy, and fullness, helping us to appreciate the richness and preciousness of this life. Interest, longing, and confidence must unite in the heat of devotion or there will be no enlightenment. Not only will you be unable to benefit others, you will not even be able to benefit yourself. Without cultivating and focusing these three aspects of devotion, we’re lost. The mind easily becomes unsettled, emotionally unstable, and confused. Therefore the continuity of sustained interest, desire, and confidence is extremely important. Once you receive the teachings and begin to meditate and practice, do not neglect these three or you will spoil the growth of your devotion. Devotion must be continuous, creatively engaged and regenerated in each moment. Interest, longing, and confidence must be lived all of the time. Often people will enjoy these beautiful qualities at the beginning, but after practicing for a while, the essentials are somehow neglected. They lose a vital ingredient and miss the point. If this happens, practice is fruitless. Being erratic and lazy can really spoil the beauty of the motivational strength that accompanies the beginning of practice. The confidence of devotion must be lived all of the time with great joy and deep appreciation for these blessings. Consider how precious every aspect of our situation is: we have encountered the Dharma and are able to receive teachings. The opportunities presented by the teacher and the blessings of the lineage are very special. They have not happened accidentally, nor have they come about by themselves. There are many causes and conditions contributing to this unique occasion. Everything comes together in such a beautiful way. We have many good reasons to feel grateful and appreciative, to fully enjoy the total wealth of our situation and bring blessings to others. This understanding empowers us, inspiring trust and devotion. When you begin to practice, lay aside all fears and expectations. Don’t expect huge results immediately, but on the other hand, don’t doubt the inevitability of the fruit or hesitate for fear of failure. Be fearless. We should really trust and have confidence in our highest principles: the reality of love, compassion, and wisdom. Even animals know that these are very special activities. Cultivating the ultimate state of love and compassion is inseparable from realization. This understanding is what is realized. On this basis, there is joy and peace. Believe and trust in the power of these qualities, and then continue to practice with confidence, courage, and commitment, free from hesitation, doubt, and expectations. Our goal is enlightenment: to realize buddhahood and to help all beings come into that freedom. You cannot expect buddhahood immediately. However, if you follow through with devotion, joyful effort, confidence, and commitment, you’re definitely getting closer and closer to full awakening. Every step brings you nearer to enlightenment, every bit of practice is leading toward the actualization of buddhanature, and the embodiment of its transcendent qualities. Once you have a good understanding about the way to Nashville, then every step in that direction brings you closer. Do not expect to arrive in Nashville in five or ten minutes; that is impossible. If you do not get there as soon as you’d like, don’t feel discouraged or think, “I’ve already been walking for ten minutes and I still can’t even see Nashville. Maybe I won’t ever get there.” Just keep going with your heart full of joy and peace, appreciating the entire journey with confidence that every step is getting you closer. If you cling to great, immediate results, your expectations can become a source of discouragement and you will soon get very tired. You will lose self-confidence and become exhausted by the feeling of not being able to get there. Such episodes can really disturb our growth and block any progress toward enlightenment. Succumbing to doubt and losing self-confidence are big obstacles to realization. This applies not only to spiritual realization, but even to the common world. If you don’t have any confidence and there is a lot of doubt in your mind, you will not achieve much. That’s because the nature of doubt is laziness. All forms of laziness hold you back. You try to walk forward, but doubt pulls you back again. You go three steps forward and seven steps backward. You are making efforts, it looks like you’re moving alright, but the whole time you are only going back-and-forth and never getting anywhere. Buddha often taught that the nature of doubt is two-headed. One head says one thing, the other says something quite different. Without one-pointedness, you’re not going to realize anything. In Tibet, the effects of doubt are symbolized by reference to a two-pointed needle, which is rather useless for sewing anything at all. Free from doubt and armed with self-confidence, we can engage the practice in a deep way. This gesture is actually a form of wisdom. Wisdom is nothing but clearly understanding the value of buddhanature and being free from doubt. If you don’t fall under the influence of doubt, the confidence and clarity of certainty-wisdom are already present. Certainty-wisdom will continue to guide you in all your practices and everyday activities, like the sun shining in a clear sky. Doubts are like clouds, which prevent true practice and achievement. Without devotion based on sustained interest, longing, and confidence, without certainty wisdom, there is neither enlightenment nor beneficial activities. The importance of devotion was illustrated by Buddha Shakyamuni when he likened it to our hands which can gather up all spiritual qualities. If you don’t have any hands, what shall you do? Maybe you can grab a few items with your feet and your mouth can probably hold something, but that’s all. You can’t do anything major. Similarly, if we practice Dharma without devotion, we’re severely handicapped and won’t accomplish much. Buddha also compared devotion to our feet, which are necessary to convey us along the path to buddhahood. Without feet, how can we go? We won’t get very far. Similarly, without devotion we can neither develop our inner realization nor benefit others. Buddha used other bodily features such as our eyes or breath to stress the vital importance of devotion. He compared it to an irrigation channel bringing water to a dry field. Devotion is the means to direct the blessings and realizations into the field of practice. Without this channel we can neither receive the teachings nor observe the precepts. It’s not that devotion is important simply because Buddha said so. Through our own knowledge and experience we can understand that if we don’t have the energy of devotion, we’re not going to learn anything. For example, if you have no interest, you’re not going to practice. If you don’t recognize the value of the Dharma, if you have no desire to understand, you’re not going to be able to work at deeper levels. Devotion is what connects us to the primordial nature. In moving from the deluded state to the undeluded state, devotion is our means of passage. Guru Padmasambhava explained the power of devotion by saying that if your devotion is characterized by confidence, then realization will arise instantly within you. Enlightenment and the blessings of the lineage will manifest spontaneously from this level of confidence in the Dharma. He also said that if you are free of doubt, you will have achieved realization. These statements indicate the doubttranscending power of certainty-wisdom. This is not just something that Guru Padmasambhava and Buddha Shakyamuni said. The life stories of all the ancient masters such as Milarepa, Manjushrimitra, and other great teachers always recount the occasions when they initially contacted their gurus or received instructions for the first time. 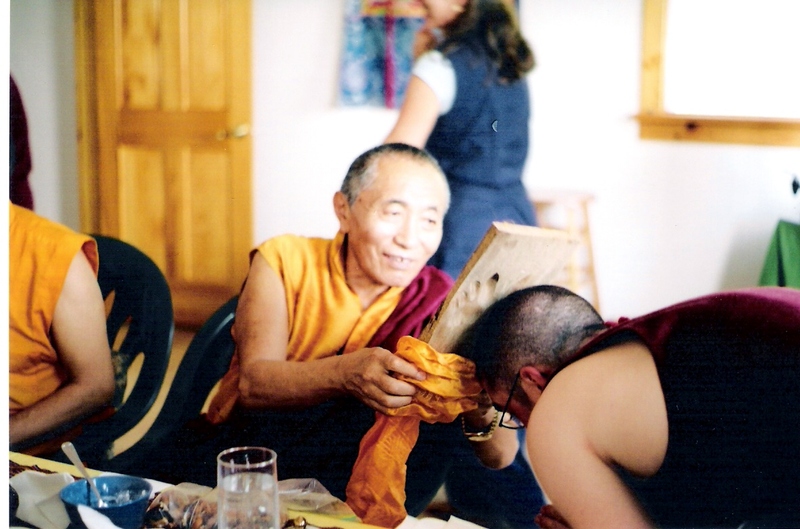 If you notice, many of them had great trouble coming to the point where they could actually receive the teachings. On the outside, it often looked like the teacher was punishing the student. Marpa seemed to be cruel and discouraging to Milarepa. Manjushrimitra looks like he was castigating Sri Singha. In truth, they were inspiring their students and strengthening their confidence. Because these students had confident devotion, they were unfailing in their commitment. They did whatever their masters instructed them to do and never slackened in their devotion. They kept the faith and were unshakeable in their course, quickly achieving enlightenment within their lifetimes. These are clear examples of the importance of confident devotion as a pre-condition in order to absorb the essential teachings and practices. There was a very famous Buddhist master known as Asanga. As a student practitioner he’d been practicing on Maitreya, the future Buddha, for about twelve years. Showing no signs of achievement, he decided to abandon his retreat. Approaching a village, he came upon a female dog with the lower part of her body rotting and full of maggots. As Asanga came closer, she barked and snarled with anger. He could see that she was in terrible pain and in a mood of great compassion he was moved to save the dog. As he tried to communicate what he felt in his heart, the dog instantly transformed into Maitreya. As soon as Asanga saw Maitreya standing there, he jumped up and said, “I practiced on you for twelve years and received no auspicious signs. You are the uncompassionate one!” Asanga became a wellknown master during his lifetime, but at this point, he was still holding to expectations and being somewhat intellectual. That’s probably why he didn’t have any good signs as a result of practicing on Maitreya, even though he did it for twelve years. There are also stories from the great Tibetan Kadampa masters who lived sometime during the 11th through the 14th centuries. Many of those great adepts were known to have been quite humble and lived very simply—just practicing in a cave or in poor, rustic conditions. Some new students came to one of those masters and said “Oh great master, please grant us your blessings.” What was his answer? “Oh my students,” he said, “please give me your devotion first!” That’s the answer. If you give devotion to the teacher, the blessings will follow. Devotion is not just some silly kind of belief or stupidity; devotion means to be unified with our highest principles in order to realize the true nature. Of course, you can continue to receive teachings and study, but eventually you have to practice. To begin practice we must have devotion. It is our connection with our true nature. Eventually, self and practice are not separate. You become the practice and the practice becomes you. But this is only realized through unceasing devotion and certainty-wisdom. To summarize: Devotion is our head, joyful effort is the strength of our muscles, and meditation, bodhichitta practices, visualizing different buddhas, and mantra recitation correspond to our heart. End all your practices and meditations with the dedication of merit and aspiration prayers. These are like the completion stage or conclusion, which is akin to feet, moving us all along the path.